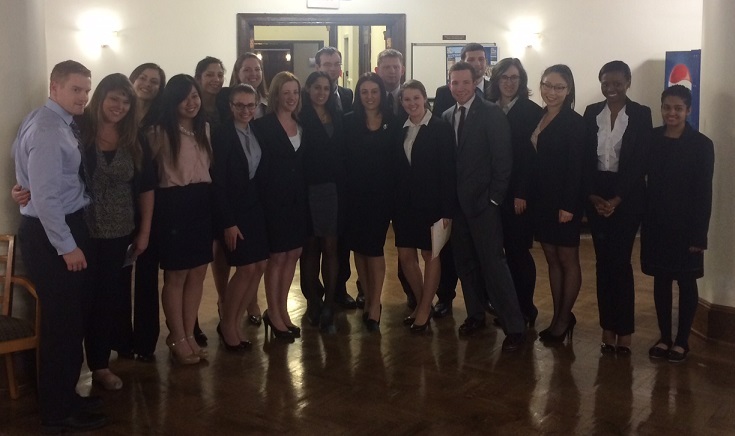 Pace Law School hosted the First Annual Louis V. Fasulo Moot Court Competition on the weekend of March 29-30, 2014. Over 160 first year students and 100 Judges participated. The students argued the merits of the case of Dimitri Christov v. Life Renewal, Inc., the subject of their 1L brief. Professors Peter Widulski, Danielle Shalov, Margaret Smith, Francis Carroll, Tamar Gribetz, Carol Barry, Diane Webster, Vicky Gannon, Lucie Olejnikova, Cynthia Pittson, Taryn Rucinski, and Gail Whittemore guided the students and prepared them for their presentations. The students were presented with questions from a great panel of experienced judges and attorneys. The comradery and the intensity of the competition provided for a stimulating weekend. After the first round the top 64 students competed on Sunday in the quest for top oralist. The students who competed in the advanced rounds were Alanna Moulds, Albert Vetere, Alexander Cirocco, Amanda Torres, Ancy Thomas, Antoinette Luciano, Ashley Kersting, Benjamin Campos, Bianca Olliver, Brad Landau, Briana Costa, Brianne Cunningham, Brielle Emhof, Brittany Patane, Brittany Richardson, Bryan Byrne, Cassandra Castellano, Cassandra Papandrew, David Rullo, Drew Gamils, Drew Levinson, Eileen Henry, Elizabeth Perreca, Eric Paulk, Eve Lincoln, Gavin Strube, Jaclyn Halk, Jennifer Robinson, Jessica Milnar, John Kolesar, Jonathan Rogoff, Josh Kauffman, Julie Hwang, Justin Baxter, Katherine Fielder, Kathryn O’Connell, Kenneth Walk, Kevin Diffley, Krista Callaghan, Kyle Pirog, Lauren Enea, Lauren Fitton, Malini Dhanraj, Margaret Lee, Mariae Gubenko, Marlon Bryan, Matthew Farnworth, Michael Chiaramonte, Michael Pesin-Virovets, Michael Sargo, Michelle Greaux, Michelle Greco, Morgann McCarthy, Naomi Singh, Nicole Wiitala, Nigyar Alieva, Nina Lee, Paul Artemeou, Peter Garcia, Pooja Shah, Rebecca Arbolino, Robert Bell, Robert Foster, Robert Palmer, Ryan Krebs, Ryan Meldrun, Sara Girgis, Sharleen Araula, Stellina Napolitano, Stephanie Paeprer, Susi Yanez, Suzanne Englot, Tatiana Rugel, Timothy O’Hara, Victoria Wagnerman, Vittoria Fiorenza, Wesley Dyer, and Zachary Oliva. The quarter-final round of 32 students included Zachary Oliva, Alanna Moulds, Alexander Cirocco, Drew Levinson, Krista Callaghan, Susi Yanez, Vittoria Fiorenza, Stellina Napolitano, Eve Lincoln, Ashley Kersting, Sharleen Araula, Julie Hwang, Lauren Enea, Nigyar Alieva, Brianne Cunningham, Kathryn O’Connell, Bryan Byrne, Cassandra Castellano, Tatiana Rugel, Jaclyn Halk, Drew Gamils, Nina Lee, Pooja Shah, Ancy Thomas, Brittany Patane, Cassandra Papandrew, Brittany Richardson, Elizabeth Perreca, Amanda Torres, Robert Foster, Ryan Krebs, and Michael Pesin-Virovets. The top 32 argued well and made it a difficult job for the judges to pick the top 16. However, Alexander Cirocco, Amanda Torres, Ancy Thomas, Brianne Cunningham, Brittany Richardson, Bryan Byrne, Cassandra Castellano, Elizabeth Perreca, Eve Lincoln, Lauren Enea, Nina Lee, Ryan Krebs, Sharleen Araula, Susi Yanez, Vittoria Fiorenza and Zachary Oliva earned their spot in the top 16 semi-final round. The final four, Cassandra Castellano, Brittany Richardson, Brianne Cunningham and Nina Lee, did a fabulous job making it an exciting final. Cassandra Castellano won the competition as Best Advocate and received a $1000 Barbri Bar Review Certificate. Brittany Richardson won second place and received an $800 Barbri Bar Review Certificate. Brianna Cunningham won third place and received a $500 Barbri Bar Review Certificate. The highlight of the weekend was the presentation by Professor Jill Gross, Director of Legal Skills, to Professor Louis Fasulo. Professor Fasulo was honored earlier this year by the senior faculty naming the competition in his honor. On Saturday the Legal Skills Professors, along with Professor Gross, honored Professor Fasulo (83’) with cider and cake as a formal celebration of his continuous efforts as Director of Advocacy Programs at the Law School. Special Thanks goes to Loretta Musial, Professor Louis Fasulo, the 1L Legal Skills Writing and Research faculty for coming to support the students, Barbri for donating the gift certificates, Dean Simon, Chartwell Food Services, Kristen Carroll, Patrick Williams, Ellen Zhang, Catherine Peña, the Moot Court Honor Board members, and our Dean David Yassky, who was able to attend on Saturday. Congratulations to Cassandra Castellano, Brittany Richardson, Brianne Cunningham and Nina Lee on this great achievement!